Although it was not once mentioned in last spring’s provincial election, reasons to be concerned about the privatization plans of the Ford government are mounting. In September, the Doug Ford government released a report commissioned from Ernst & Young that recommended imposing means testing and user fees for our universal social programs, such as health care and education. This would violate the Canada Health Act, which protects patients in need of care by banning such user fees. It is a direct attack on the cornerstone principles of public health care for all. This report was clearly sanctioned by the premier. Word out of Queen’s Park is that the report is “directional” and the government is working on its implementation. In October, we invited Premier Doug Ford to a rally at the Ontario Legislature. It was one of the largest rallies since Ford’s election and police estimated 8,000 people in attendance. The NDP, Liberal and Green leaders came, and, to varying degrees, committed to our “asks” that they stop hospital cuts, restore health services and stop privatization. Ford‘s aide informed us that the premier was not available. Ford would not provide an alternate spokesperson, nor make any commitment to stop cuts and privatization. The day after being sworn in, the Ford government cut OHIP+. It expanded public drug coverage to all Ontarians under 25. It would have replaced costly for-profit private insurance plans with a less expensive (and full-coverage) non-profit public plan. Ford’s cut forces families to seek coverage from their private drug plan first. Not only will this add paperwork and delays but private drug plans have ever increasing co-payments and deductibles. For families of kids with cancer, for example, costs can amount to hundreds of dollars per month. The very first act of the Ford government benefitted private insurance companies and hurt families with sick kids. Ford’s election pledges to axe cap-and-trade and implement tax giveaways that overwhelmingly benefit high income earners and corporations will cost approximately $22 billion. That’s $22 billion less for health, education, roads, transit, housing, parks and so on: among the most severe cuts in our history. We anticipate these cuts to start in earnest after the federal election. They will almost certainly result in privatization, if we do not stop them. Former Alberta Premier Ralph Klein called public health care the “electric third rail” of Canadian politics: the rail that runs between the tracks and if you touch it you get electrocuted. It is time to electrify that third rail. Regular Ontarians in every walk of life have a role to play in standing up and insisting that Ford commit to safeguard and improve our public health care, not cut and privatize it. 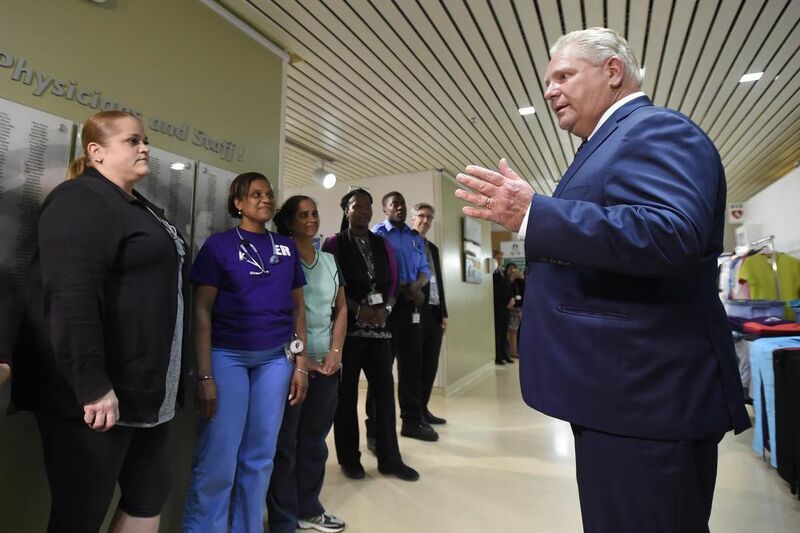 Ford has no mandate for this, and if he tries to touch our public health care system, it will mark the day that began the end of his political ambitions. Natalie Mehra is the executive director of the Ontario Health Coalition.